from 10:00 a.m. - 10:45 a.m.
We proclaim him, admonishing and teaching everyone with all wisdom, so that we may present everyone perfect in Christ. At KUMC, we believe in the ministry of Christian education and formation. We believe that this ministry is the foundation for lifelong learning and growth toward a mature and vital faith. Through intentional learning and Christian formation, we become the people God calls us to be, and we develop gifts and strengths for encouraging and leading others to the same strong faith. 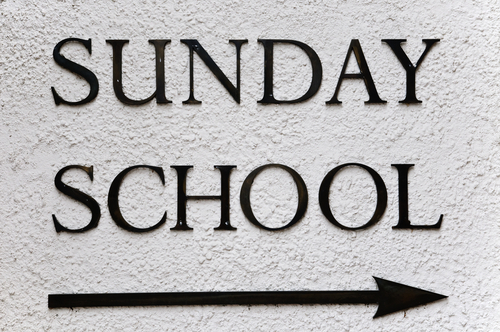 KUMC offers Sunday School classes for all ages, led by nuturing and committed volunteers. These classes meet each Sunday from 10:00 a.m. until 10:45 a.m. Become part of our journey to a deeper, more personal connection today! Johnson-Doub Class: This class uses the Uniform Series International Bible Lesson Curriculum and enjoys the biblical and scholarly perspective given by the writers of the course material. A rotating series of teachers present stimulating lessons that explore biblical messages with a focus on practical life application. Class members typically arrive at 9:45 a.m. and spend the first 15 minutes in fellowship time and reviewing prayer concerns. The class discussion begins at 10:00 a.m. This class is open to any who would like to attend. All visitors are welcome. Seekers Class: As seekers in the Christian journey, members of this class look for ways to explore their faith, discuss relevant topics and enjoy time to fellowship together. This Sunday school class is a great mix of all ages, singles and couples that look to do just that. Class begins with a time of gathering and fellowship until 10:00 a.m., followed by a sharing of joys and concerns. A wide variety of topics and books are covered that allow the participant to deepen their faith and grow in their discipleship. This class follows the Wesley quadrilateral as a method for theological reflection which encourages the use of intelligence, experience, the tradition of the church and scripture to deepen one's understanding of God. This class gladly welcomes all visitors. Family Life Class: This class consists of adults with families of all ages from young children to empty nesters. Using a variety of study materials, the group discusses relevant topics and enjoys a time of fellowship each Sunday morning. The class is open and all visitors are welcome. It begins at 9:45am with fellowship and prayer time. Class starts at 10:00am. In addition to Sundays, many of the classes also get together for social functions throughout the year.